Hello Everyone! It's been over a week since I've posted anything. Sorry about that. I also need to get out and visit a lot of you as well. 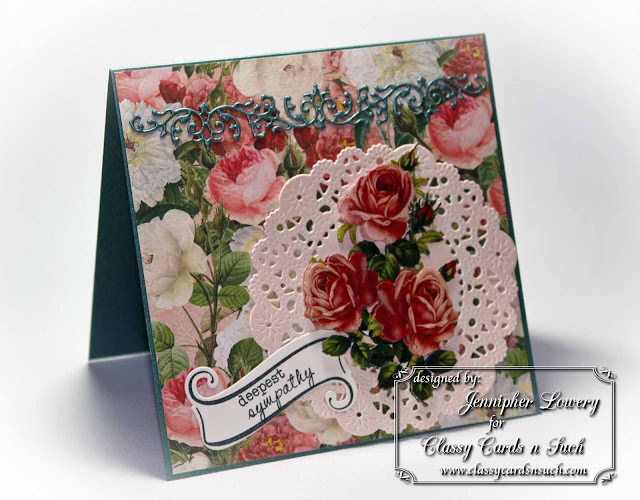 Here is another card made with fabulous products available at the Classy Cards N Such Online Store. None of us really like to think about it but unfortunately, there are times when we least expect it and we need a sympathy card. So, I like to make at least one sympathy card a month to have on hand. I started with a 5.5" square card base of Stardream Emerald. It has such a beautiful subtle sheen to it and really coordinated well with the greenery in the designer paper from the Webster's Pages Ladies & Gents/Trendsetters Collection Combo Pack. This collection is also in the clearance section of the store now! Since I already knew in my mind that I wanted to work with the 3-D Die-cut Red Roses, I chose a rose pattern to add to the base of my card. Before I assembled my rose I knew that I wanted a nice base to display it on. I used the French Pastry Doily Die and the Stardream Chiara Coral cardstock to create a lovely pale pink doily to mat the rose on. Then I began to assemble the rose using foam pads. 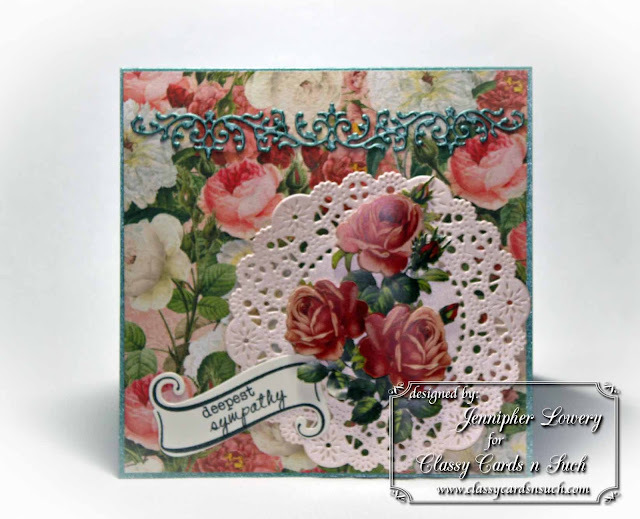 I used the Verve Scroll Plain Jane stamp and matching die to create the scroll to stamp my sentiment on. My sentiment comes from the Verve Borderline Stamp Set. For finishing touches I added a Mini Flourish Band in Stardream Emerald. Thanks for stopping by today. I hope you have a fabulous week! Beautiful card for a sad occasion. Lovely card. I like how you were inspired by the sketch. This is beautiful! I need to get some sympathy cards in my supply. They aren't easy to make at any time, but when they are needed, I think it's harder! Awesome sympathy card!!! I just adore this design. Wow, this is so pretty. What a gorgeous sympathy card. Very nicely done! Absolutely elegant. I'm sure it will bring comfort.